If you are planning a wedding, corporate event, or even a birthday celebration, you know that having the right party favors can make or break the entire event. When you gift our natural California honey, your guests walk away enjoying and appreciating their thank-you gift. We have a wide variety of products to choose from, including everything from party favor jars to honey variety gift packs. No matter what type of celebration you host, we would love to be a part of it. 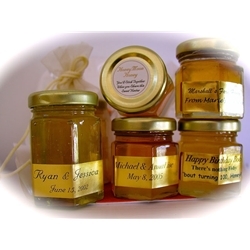 Check out our complete selection of honey party favors and order yours today. We even offer personalized honey label jars so you can add a special touch to each and every one of your party favors.